My granddaughter, aged 11, has asked me if I have yet written a blog about her. She had overheard someone ask me what I blog about, and I said, ‘Mainly about things that have inspired me to write.’ So she definitely has a point, because my grandchildren are high up there in the list. Ever since I (or she) can remember she’s been asking me if I’ve written a book for children yet. 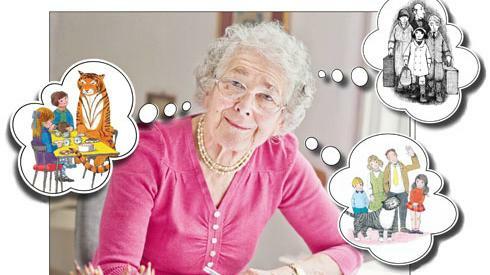 What a waste to have a granny who writes books, but only for adults. I’ve told her that writing for children is a lot more difficult, that it’s a long time since I was a child, that I don’t know what it would be about. These are lame excuses. Pirates, she suggests. Treasure. Danger. Magic. That’s not really my thing, I say, I write more about real things. Like Jacqueline Wilson? But immediately she decides No. She loves her books passionately, but there’s only one Jacqueline Wilson. She was onto it, instantly. A book for three year olds, she decided (her cousin is three.) And funny. Before we got off the bus she was half way through inventing it – about children going to an animal centre to find a pet, and choosing one unsuitable one after another – in occasional rhyme, and it was funny. She wanted me to type it out, quick, and an hour later the story was there. I had made occasional suggestions – she knew instantly if they were a good idea, but mostly they were dismissed. The story was hers, I was just the scribe. Press one button and out it came, fully formed. Amazing. I usually started at four. Which I was, and of course she knew. She had started asking when she was two, when we explained to her that Ralph had died because he was very old. Ninety. She is a child who needs to know, who will imagine if you don’t tell her, and whose antennae are always out to check that she has been told the whole truth. She’s given up asking how old I am. I do just keep reappearing, so years matter less. But when I did finally write that story for children, and it was published in a collection, I read it to her, sitting in a pizza cafe, just her and me; and she recognised immediately why it started the way it did. How old am I? Seventy-three. Maybe that seems old to you, but actually I’m far older in the stories I can tell. I go back more than a hundred years to the stories my mother told me about when she was a child, and I intend to be here at least until you’re grown up, so the stories go forward too, imagining the world you’re going to be living in then. I’m kind of poised on the middle of a see-saw of stories. I have only one photo of my mother when she was a child, and it’s full of scratches. Here she is, over a hundred years ago. She was born in Scotland and lived in Edinburgh with her dad. She could hardly remember her mother or her sister, because they both died when she was very young, of TB – tuberculosis, a disease of the lungs. They lived in a cold damp flat – maybe that was part of the reason her mother and sister got ill. 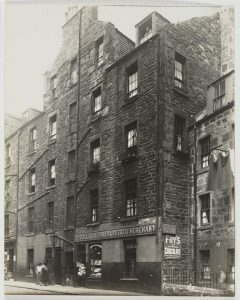 This photo is of a tenement building in 1900, about the time my mother was born. They were very overcrowded, and impossible to keep clean and warm, and disease spread easily. TB used to be very common, and one of the lucky things about living now rather than then is that there’s a vaccine for TB, so not nearly so many people get it, and even if you do there are anti-biotics to treat it, which there weren’t a hundred years ago. Her dad was anxious that she too might get TB if they stayed, so he took her off to somewhere with a warm climate where he hoped he could get a better job so that they wouldn’t be poor. That’s called emigrating – going to another country to try to make a better life for your family – and in the country you arrive in you’re called an immigrant. After that she lived in South Africa, and so that’s where I was born. By the time I grew up, things were pretty bad there. 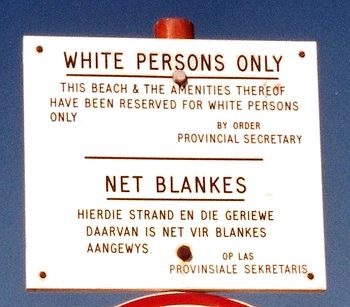 The government divided people into different categories, depending on where their ancestors had come from – ‘white’ (originally from Europe); ‘black’ (African), ‘coloured’ (mixed background) and ‘Indian’ – and all the laws favoured the whites, who had most of the land, and much better schools, houses, etc. People had to live in separate areas so you couldn’t easily meet people from other groups, and it was actually illegal for whites to marry black or coloured people. You can hardly believe such craziness could happen, but it did, and if anyone criticised the government they got in serious trouble, including going to prison. It became dangerous for us to stay, so when we were young grownups, just after university, we left our country, just as my mother had left hers, but for a quite different reason – and we came to Britain. So you come from a long line of immigrants; and you’ll find that a great number of people everywhere do too, if you got back far enough in their stories. It’s good to remember that, if you hear people talking as if immigrants are a problem. Actually, they’re usually people who didn’t just lie down under problems but decided to try and do something about them. A country that gets a lot of immigrants stands a good chance of getting a lot of remarkable people joining their team. There’s a story about my mother that I want to tell you, because although it happened a hundred years ago, it’s got a lot to do with the world we live in today. When she was eleven a war started in Europe, with Britain and a lot of other countries on one side, and Germany and Austria on the other side. People called it different names – The Great War, or The War to End All Wars – because it was so terrible they thought none of their governments would ever be so stupid as to start another one. Kathleen – that was my mother’s name – and her dad were 6,000 miles away in South Africa, and he could have decided that the war had nothing to do with him. But it was only four years since he had left Scotland, and he felt he should go back and do something to help. So they sailed on a ship all the way from Durban to Plymouth, a journey that took weeks. 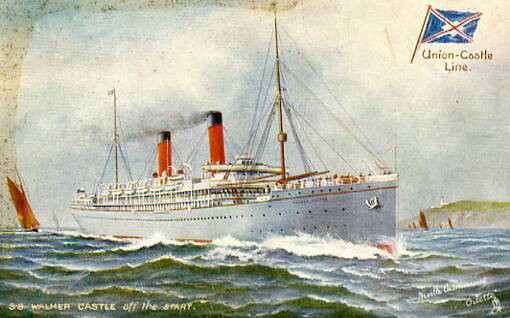 This postcard illustration is of the Union Castle Line’s Walmer Castle, the actual ship she sailed in. It was dangerous because there were German submarines called U-boats that attacked British and American ships. She was scared, but also a bit excited, and she sat at the prow looking out for a periscope so she could become famous by being the first to warn the captain. They got to Scotland and went to stay at first with her dad’s family. All the younger men were away fighting, and a couple of her cousins were nurses looking after wounded soldiers. Her dad was just too old to go and fight, which was lucky because if he had been sent to where the war was happening, she soon wouldn’t have had a dad either. But there were other kinds of war work that people did. They grew food to feed everyone, and kept the railways running, and worked in factories making ammunition. What her dad did was to set up hostels for men who were working in factories far from their homes. Kathleen went with him. She would go to school for a few months wherever they were, and then they would move on to set up another hostel in the next place. After the school day, she helped him run the hostel, so she was doing war work too. 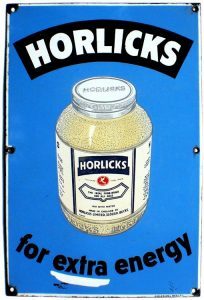 One of her jobs was to take around glasses of Horlick’s Malted Milk, and little cakes with pink icing. 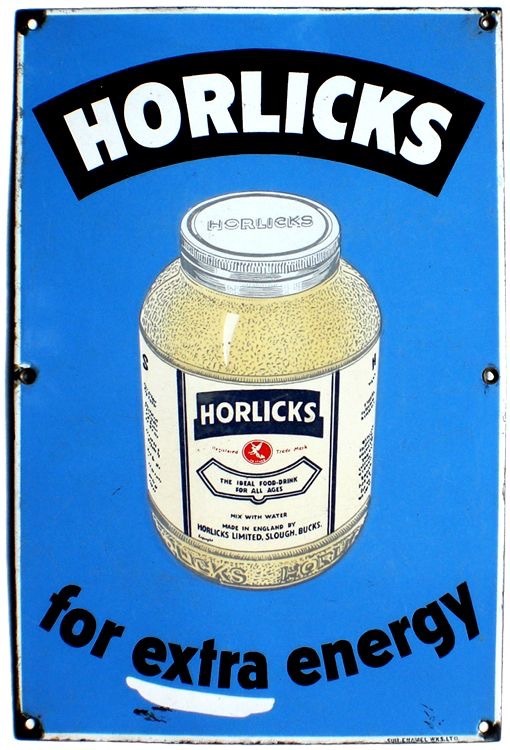 She got to be a very experienced waitress, but you can get tired of fake pink icing, and after the war was over she would never, ever drink Horlicks Malted Milk. It was when they were setting up a hostel in the Highlands that they had the biggest adventure of her life so far. It was in a village called Kinlochleven, at the head of a long inlet from the sea, where there was a factory making something hush-hush from the newly invented alloy, alluminium. About a hundred men worked in the factory, and the hostel was for them. The village was surrounded on three sides by steep mountains, and people said that there was a reservoir up there that provided hydro-electricity for the factory, and a prisoner of war camp, where German prisoners were being put to work building something new, that no one was allowed to talk about. There were always army trucks passing by, heading up into the hills. Of course Kathleen never got to see them. But by now she had spent a lot of time hanging around while adults were talking, and everyone seemed to hate the Germans, and told stories of terrible things they had done in Belgium. Just knowing that some of them were up there in the mountains brought the war suddenly closer. It was winter – the coldest one anyone could remember. The ground froze, temperatures plummeted. Everyone struggled to keep warm. Being surrounded by mountains, the nights closed in early, and the village was very isolated. There wasn’t much news of what was happening in the trenches in France, but by now everyone knew it was a disaster. Women knitted socks for the soldiers, but it was hard to imagine that they would do much good. Then, one dark November night, the worst storm you could ever imagine broke over them. The wind and rain lashed against the walls and roof, as if intent on destroying them. Then lorries arrived, soldiers came bursting in, and behind them, coming in out of the dark and cold, a crowd of rough, bedraggled men – the prisoner of war camp in the mountains above had been completely flooded out. The prisoners had been bundled into whatever transport could be found, and here they were, billeted on the hostel, huddling in blankets in rows on the floor. Everyone was up and busy-ing about. Her dad got her going on the Horlicks Malted Milk routine. She was terrified, certain sure she was going to be murdered, but her dad was in charge, and he had a lot of principles that could sometimes be inconvenient. One of them was that you receive people and welcome them, and you never turn away anyone in trouble. These men might be Germans, and prisoners, but they had fled from the storm, and she knew he was going to consider it his duty to treat them as he would have treated anyone else in that position. So she had no choice. She stepped carefully between the bodies in blankets, trying not to look directly at their faces while handing over the mugs. And then it happened. One of the men raised himself on one elbow and wordlessly beckoned her to come nearer. Mesmerised, terrified, she moved towards him. She was right up next to him before he indicated what he wanted of her. He pulled out from inside his tattered jacket a photograph of a young girl. His daughter, about her own age. For years afterwards, she wondered about that girl. Was she also an only child? Did she perhaps also only have a dad? And did she ever see him again? Here’s another story that’s kind of connected – from a hundred years later. You’ve heard about Syrian refugees, and people crossing the sea in small boats? I wonder if you heard about the girl who loved swimming? Her name is Yusra, and before the war she used to train regularly, and hoped one day to compete internationally. Then they had to flee. Eventually she and her family were in one of those boats. It started leaking, and she knew if she did nothing they would all drown. Her sister could also swim, so she and her sister jumped in the water and pushed that boat while they swam, and while those in the boat scooped out the water. They got to the island safely – her strong swimming had saved them. Later, when she had found a country to settle in, they spotted her talent and she got more training – and made it to the Olympics, as part of an international refugee team. Imagine if you were someone like her, with an ordinary life, doing things you were interested in, and one day your mum and dad said, ‘It’s too dangerous to stay, we have to go.’ Imagine you are one of the lucky ones – you get away from those bombs, you get to the coast, you have enough money to pay the people who are selling old boats – so battered that you’re really lucky not to drown, and you land on the beach of a small island in Greece, that is swarming with others – five thousand people arriving every day. For a few days till you recover you’re in a refugee camp – there are new ones being set up all the time to handle everyone who is arriving, but you look around you at the miles of tents and you think, If I stay here, I’ll be stuck forever. You’ve risked everything to start a new life – you can’t give up now. So you pack a bag – just water and a little food, nothing else – and at night you set off to walk, hoping to get to a country that will take you and let you live like a normal person, get a job, make a home. You come to a border – and you see that they have built a huge fence, and there are policemen with guns patrolling it. On the other side of that fence, and beyond all the other patrolled borders, there are people saying, We don’t want refugees. They’ll take away our jobs, and crowd out our schools. Why are they coming anyway? But there were also lots of people on the other side who could imagine what Yusra and the others must be feeling, because they too had stories in their lives about walls and fences. Imagine growing up in a country that’s divided into two, East and West, and people can’t move freely between them – like, if you’re on one side and your gran lives on the other, you can’t visit each other. That’s what happened in Germany, and on the east side was a girl called Angela. When she was seven a wall was built right through the middle of Berlin, Germany’s most important city, so even in that one city no one could cross from one side to the other. Angela grew up with that wall, and with the police watching constantly to stop people crossing – and she knew that in the end walls don’t work. For one day – she was grown up by then – people got so angry that without anyone organising it, they suddenly started smashing that wall down. The two Germany’s became one; and she gave up her job to go into politics, to help reshape their country. It was brave, because she knew it was going to make her unpopular, which is a thing few politicians will risk. 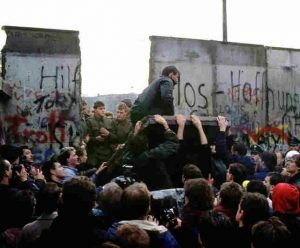 A lot of her supporters were very alarmed – ‘There are too many refugees,’ they said, ‘how can Germany accept them all?’ And what made it so important that she took that risk, is that by opening the doors she shifted the discussion from ‘How many can we take this time?’ and forced people to think about the long term future. There will continue to be wars and crises that will make people flee – and it’s going to be a continuing challenge to all other countries about how to respond. She didn’t come up with a solution, she just said, We know, from Germany’s experience, that building walls doesn’t work. We have to try to imagine a future where we don’t label people as ‘us’ and ‘them’, and only the ‘us’ people are allowed in. Here’s another way to look at what’s happening. Think about some of the famous people you have heard of, and you’ll be amazed at how many of them were immigrants or refugees. Handel, the greatest English composer, was a German immigrant. Einstein, whom some people think was the cleverest person ever, he was a refugee. You remember the Mog stories? They’re by Judith Kerr – she was a refugee from Hitler. Mo Farah, Britain’s greatest ever athlete, came to Britain as a child, in a family escaping from Somalia’s civil war. We’d be here forever if we started listing the refugees who have been pioneers of science, of music, or have excelled in every sphere of life. Of course most refugees are like you and me, just ordinary people. All that’s different about them is that they have had to flee from terrible things – and you or I would have fled just as they did, if it was our homes the bombs were falling on. All they want is a chance to lead an ordinary life. For some of them, it’s a lot worse than that – the awful things that have happened to them have damaged them psychologically, and they need special help. We’d hope someone would help us, if we were in that kind of trouble. But the reverse also often happens. Sometimes, when people have had to face tough times and take scary decisions to save themselves and their families – and then have had to adjust to life among different people – sometimes all those challenges bring out extraordinary qualities in them, and they contribute more than just ordinarily to their new society. There may be a lot of people saying negative things about immigrants and refugees – but the opposite is also happening. Everywhere there are people saying what Angela Merkel said – We welcome refugees. We want to imagine a world where we don’t put labels on others to divide us. We are all in this together. Now here’s one last story, that might give you an idea of something you can do. Years ago there was an English boy, Jamie, who wanted more than anything to be magician. He learnt loads of magic tricks and started giving shows, but of course he had to get a proper job. After a while he started working in Palestine, campaigning to make life better for people caught up in wars. He learnt to speak Arabic, so he could be useful talking to people and understanding their situation. Then he got to Lebanon, while the Syrian war was going on, and like all the countries nearby, Lebanon had loads more refugees arriving. Things are so uncertain that people are living wherever they can find a place, like in broken down and overcrowded apartment buildings. Jamie thought about how stressed those kids must feel by what they’d gone through, and he decided to cheer things up by giving them magic shows. Well, you can just imagine – it was the most fun thing that had happened to them since they had left their homes. 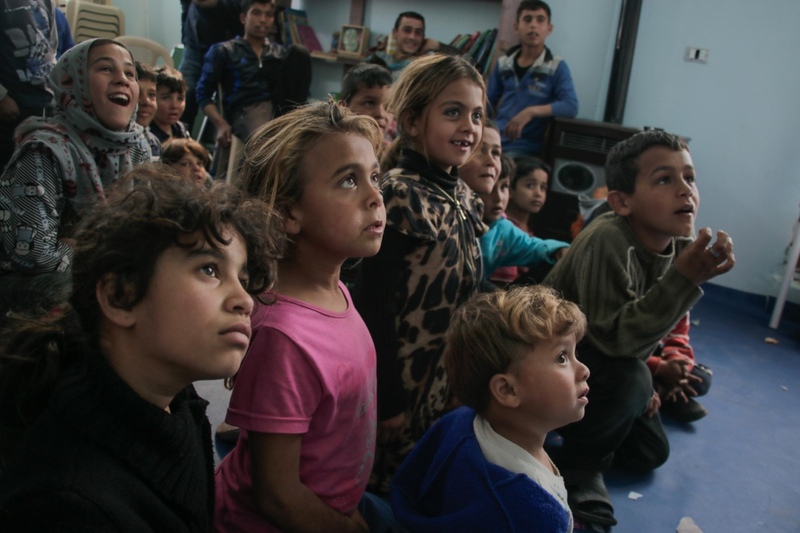 Look at the faces of these children watching – they are spell-bound. Their imaginations are working away, and their brains are trying to figure out how the tricks work. 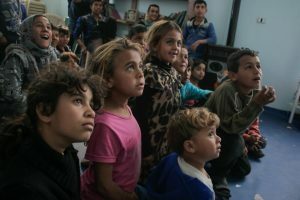 These are children who live in an over-crowded area with no facilities – and no schools, nothing to stop them running wild – and no hopes for a different future. Then volunteers from a local organisation built this activity centre and started making some good things happen. In another show, at a school in the hills that some churches have set up for refugees, there was a boy called Aaref that Jamie says he’ll never forget. When his teacher asked him what he liked best about the show, he just smiled and smiled and said, ‘Everything’. Jamie got so inspired by those kids that he gave up his day job so he could do magic shows the whole time. I love that story, because it’s not just that something good happened for the refugee kids – Jamie also got his life’s ambition! He’s a full time magician now. But there’s a snag – see if you can work it out – Who’s going to pay him? He’s given up his job but he still needs to earn something to live on, and the parents of those refugee kids don’t have money for tickets for shows. Sometimes there are organisations that will pay, but if no one can, he’s doing them free. But if it’s going to last, others need to chip in. If you and your friends are looking for a way to help refugee kids, see if you can raise some money, and you could fund a couple of shows. Check him out on google – the project is called Magic for Smiles, and he calls himself Jamie Jibberish because of all the funny words he uses in his show. They’re not English words or Arabic, they’re the international language of magic. Join him, and make some magic happen. And if by the time you get to do it, Magic for Smiles is sorted, there will be something else, because so many people are coming up with great ideas all the time. You can too. Yusra Mardini, Syrian refugee swimmer at the Rio Olympics, 2016 – CBS News. 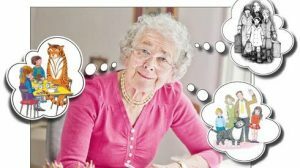 Judith Kerr imagining her stories – Jewish Chronicle. Young Angela Kasner (later Merkel) – Emaze. Children at magic shows: Jamie Balfour-Paul, and two local organisations supporting refugees in Lebanon: Syrian Eyes, in Bar Elias, Bekaa; and Mishwar, in Minyara, Akaar. The other photos – including the grandmother reading – are unnamed free downloads from the internet. 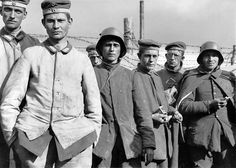 The German prisoners of war in the photo were captured by Australian forces. You can donate money to fund magic shows at http://magicforsmiles.com. 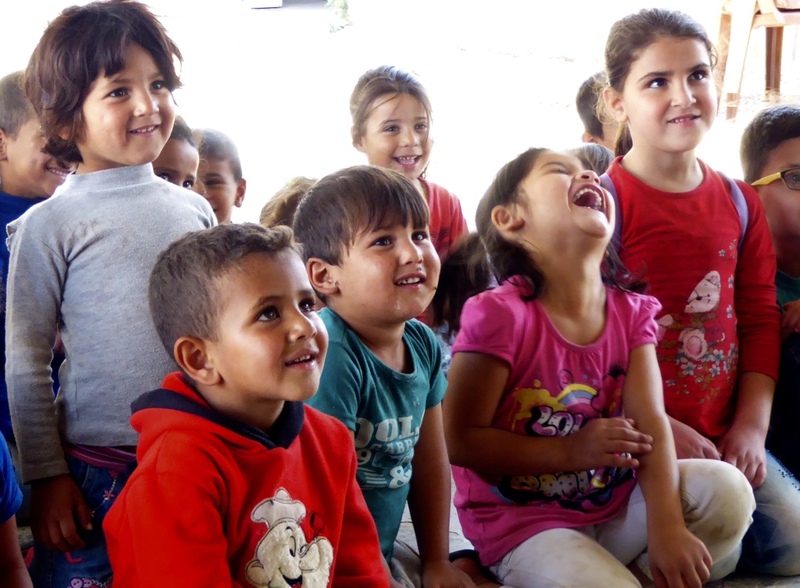 A very moving blog Marion and such an illustrative way to talk about immigration to children. 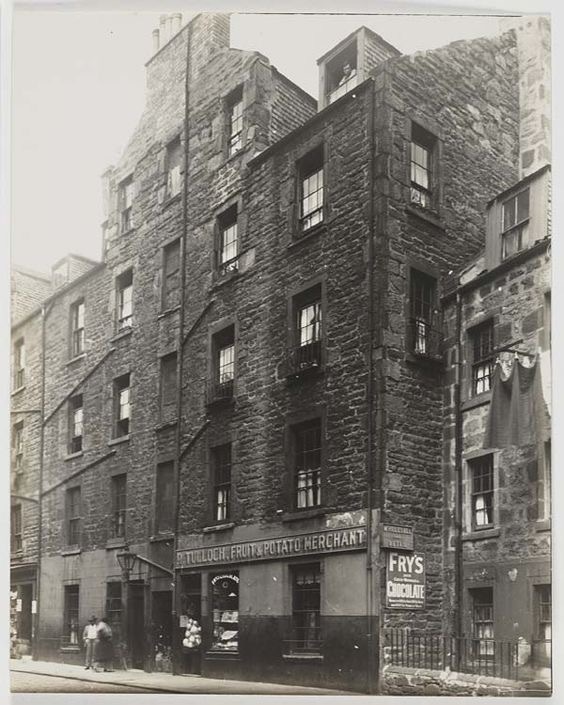 The other thing that struck a chord was that my mother and her two older sisters were born in Edinburgh, in a tenement in Leith in the 1900’s? My aunt, after whom I am named also died of TB. My other aunt, the eldest, told me the story of how, lying in a bed in an alcove off the main room she would listen to her father and his friends talking – this was the beginnings of the Labour Party in Scotland. She remained a firm Labour supporter all her life and became the manager of an international company after losing her fiancée in the war. She was a woman ahead of her time. I loved her. Marion you are an untiring force for good. Where would we be without people like you? Much love and admiration. Julian. So moving and so pertinent to our lives here in Pakistan. I have a 11 year old granddaughter Anya..who draws all the time, stories that pour out of her head. I will read some of this with her tonight. I know she will shed tears- she does that very easily with any story that moves her. Love your story, Marion. Imagine a world in which there were more grannies like you! I’m a fan! Writing for children has so many pitfalls, but you’ve got it exactly right — factual, empathetic but unsentimental and not a hint of condescension. I’m going to read it to my littlies. Thank you! A moving and inspiring blog piece, Marion, that I have felt compelled to tweet, so powerful it is! Thank you!